Frequent cannabis use during adolescence and young adulthood raises the risk of psychotic symptoms later in life, research suggests. The risk was much higher in young people who were already genetically vulnerable to developing psychosis. It is thought cannabis disrupts the balance of the key mood chemical dopamine in the brain. The research, by Maastricht University, is published by the British Medical Journal. It is time to ensure that this information is in the public domain and, most importantly, available to teachers who are health educators in schools. It focused on 2,437 young people aged 14 to 24 who were monitored for four years. After adjusting for factors such as social and economic status and use of other drugs, tobacco, and alcohol, the researchers found cannabis use moderately increased the risk of psychotic symptoms. However, the effect was much stronger in those with a predisposition for psychosis. And the researchers said their findings did not support the theory that the link was simply down to people with such a predisposition being more likely to use cannabis, rather than cannabis in some way making psychosis more likely. There was little evidence that people who were genetically vulnerable to psychosis were any more likely to indulge in drug taking, they found. Lead researcher Professor Jim van Os told the BBC News website that using cannabis was not a good idea for these people. He said: "If there is a family or personal history of mental frailty - stay away form it!" Martin Barnes, chief executive of the charity DrugScope, said: "The research underlines that there are potentially serious health risks associated with cannabis use, particularly for young people. "The challenge is to ensure that messages on cannabis use are understood by teachers and health professionals working with young people and conveyed in ways that young people will listen to. "Shock tactics alone rarely work, but we need to get across that just because you know people who appear to be OK using cannabis, it doesn't mean that are or that it will be OK for you. "After reclassification, which DrugScope supports, cannabis remains an illegal drug. Most young people know that cannabis is illegal and harmful, but some may not appreciate what the harms can be." 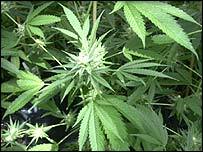 Dinah Morley, of the charity Young Minds, said the study added to previous work suggesting an association between cannabis and psychosis. "It gives support to the emerging understanding that a predisposition to psychosis combined with the early abuse of cannabis has an increased likelihood of triggering a psychotic illness. "Further exploration of why this should happen - in terms of neurological development - will be needed. "Nevertheless it is time to ensure that this information is in the public domain and, most importantly, available to teachers who are health educators in schools." Marjorie Wallace, Chief Executive of the mental health charity Sane, said: "Britain's position as the cannabis capital of Europe could have hidden and disturbing consequences. "We need to make the risks known, clamp down on drug dealing in such places as playgrounds and hospital wards, and change perceptions of cannabis from being a recreational relaxant to a dangerous substance for those who are vulnerable." Cliff Prior, of the mental health charity Rethink, called for clearer warning about use of the drug. He said: "Reclassification has sent out a mixed and confusing message. "There is a strongly-held view that cannabis is risk-free, reflected in the rates of its use among young people. "Cannabis is not risk free. We have known for years that using cannabis makes the symptoms of schizophrenia far worse in people who already have the illness. "There is a rapidly growing body of evidence showing that cannabis can trigger schizophrenia in people already at risk - and probably even in people who should only be low risk." Is cannabis a risk to health?